What more can I say but we love Apologia Educational Ministries. Their newest addition, Exploring Creation with Health and Nutrition by Dr. Laura Chase, does not disappoint. 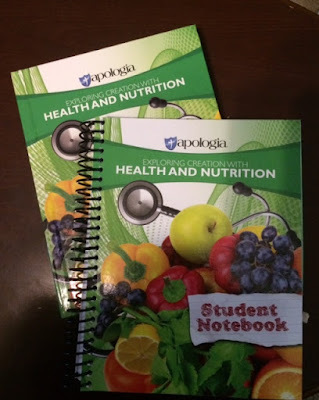 I received a hardback copy of the textbook and a spiral bound softcover of the student notebook (Health and Nutrition Basic Set). The textbook consists of 441 pages and 15 modules (chapters) and the student notebook consists of 366 pages. 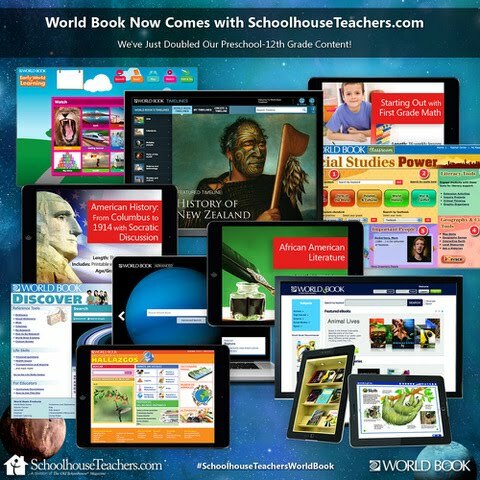 You will need internet access to use the Book Extras and be able to access the answer keys for the tests. Who Am I and Why Does Health Matter? There is a notice about reviewing the topics and being sure that your student is mature enough to handle some of the content, especially on sexuality and reproduction. Now, I may be a little biased because I love Apologia, but seriously, I keep my reviews honest and try to give you a good picture of what we thought. This curriculum is designed for high school students and is set to be taught for an entire year. If you follow the schedule laid out your student will complete 3 assignments per week for a year. You can adjust the schedule to cover 5 assignments a week and complete it in one semester if you choose. The course does qualify for one full credit and meets the state standards for a health course if you need it. Suggested schedule for the yearly track. I chose to use it as a full year, especially since my struggling learner 9th grader is still so difficult to get through his assignments. I really like the schedule that is suggested but at times it didn't necessarily seem to flow well. A perfect example was when we got to Module 3 and the first assignment included completing project 3.1. There are 21 self-care tips that they ask him to list but based on the reading assignment for the day it only goes to tip 11. The project does say to complete as they get to the tips, but that means they don't finish the assignment until later, but it is not listed again as an assignment for later days, there are new project assignments. This confused him and frustrated him and made him think he had to do extra work. On Your Own (OYO) section of homework. I like that it is only 3 days per week so that he gets a break on the subject. This part of high school will be better for him to have different subjects on different days. It is still such a struggle with him. The layout of this curriculum will help ease him into high school work. He is learning more to use a syllabus per se and follow a schedule on his own for more independent work. I know most have already accomplished this with younger students but not so in my circumstance. The amount of reading is very reasonable and I really like how they leave a decent amount of space in the workbook to take notes on the reading. It is also part of the good training I have mentioned. Getting him to highlight and take notes is like pulling teeth!! Sample Project page for homework. While the On Your Own (OYO) questions and answers are in the textbook, the textbook DOES NOT include the Project assignments, study guides (for the tests), or tests. You need the Student Workbook for the project assignments, study guides, and tests. Speaking of answers, I do not like that the answers to the OYO questions are in the book. Nor do I like that the tests are included in the back of the Student Workbook. This is very bad in my situation since we are not at the point of honesty and trust where cheating does not occur. There really needs to be a separate Teacher Guide. I know most wouldn't like this because of the extra cost, but really, answers and tests need to be separate. I get that this is set up for self-study and that is great, it just doesn't work in my situation. At the beginning of the Student Workbook, there is a page on instructional support and Apologia generally has audio and visual resources for their courses. I could probably use this for this course but neither are available at this time. I hope they will be forthcoming. Sample page of grading sheet. As far as grading goes, there is a nice grading page in the student workbook with complete directions and tips on how to go about grading the assignments (a nice rubric). This leads me to another wonderful resource that Apologia provides, their online Book Extras. You get a password in your book to use for additional resources. For Health and Nutrition, this includes links for further study for each module (organized by module) and the answer key for all the tests. Book Extras online page links. We are into Module 3 and I will still have to go back and clean up a few areas he has missed. He is just not in the self-study mode at this point. I really like being able to go to the extra resource links on the Book Extras page online and delve a little deeper into the subject matters discussed. Another extra that is available is the FREE activity e-book, Whole-Health, God's Design for Your Body, Mind, and Soul. It has more information on who you are and how you interact with the world around you. It discusses influences in your daily life and has work pages for you to log a week-long diary describing your everyday influences. It also includes a nice Q and A with author Laura Chase, snack suggestions, snack recipe, and a fun word search. My final thought on this curriculum is that even though there were some minor drawbacks for us, I highly recommend Exploring Creation with Health and Nutrition by Dr. Laura Chase and look forward to digging deeper into the book on the upcoming topics. You can connect with Apologia Educational Ministries on FACEBOOK, TWITTER, PINTEREST, INSTAGRAM, GOOGLE+, and YOUTUBE. Please be sure to check out the reviews from my fellow crew members. I was in the coop the other day collecting eggs and checking on the babies and saw this!!! Ughh! It is most of a snake skin that has been shed. The rest of it was intertwined into the chicken wire that divides this section for my babies. I don't currently have any babies in that part right now. So grateful for that! Snakes in the chicken house are NO GOOD! Especially with the babies I have in there right now. I have littles, tweens, and teens. I have been doing careful headcounts on all of the littles at least once or twice a day. Never did find any snake but several months back hubby found one in the coop and just the other day they found one down by the septic drain area. I know we have the black rat snakes around but it's important that they don't enter my chicken yard or coop! Can't believe it got past all the chickens! And shame on my roosters, they should have been able to scare it off. Who knows. Have you had any interesting visitors to your coop lately? Remember Pip? The cute fuzzy rejected chick that was adopted by another broody hen I had? She's growing up! At least I am still hoping she is a she! Her and her 3 siblings are doing great. I already know that one is a cockerel (rooster) and another is definitely a pullet (hen). 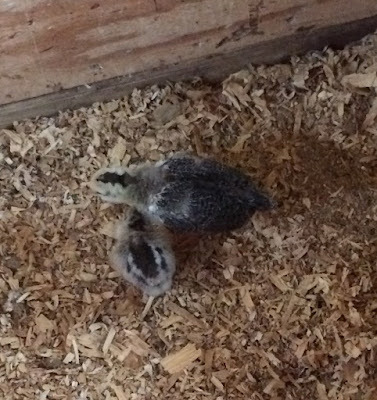 The cockerel is a Barred Rock cross (he looks purebred) and the pullet is an Australorp cross. 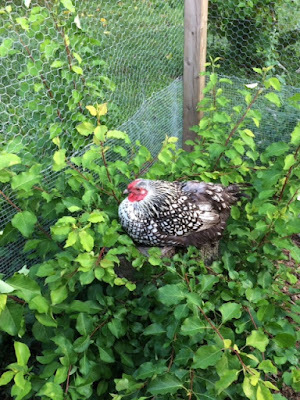 I am still hoping that Pip's other sibling, Pepper, is a pullet also. She's certainly sassy as all get out. The other 14 babies we have are also doing great and I will need to get updates on them also. Can't believe we have 18 babies!!! We had 19 but one of the pullets perished within 2 days after we brought her home. She was one of the production breeds from the store when I purchased those last 6 for my other broody hen who ended up rejecting them anyway! Bertha, the second broody mom who was already raising 7 took on the extra 6 (now 5). Five of the twelve are still fairly small and should still have their mom with them but since the others were older she decided to give them all the boot. She is no longer mothering them and they are on their own. They are all doing well and pretty much stick together and watch out for one another. My main coop crew are all used to having babies run around so it hasn't been too much of a problem. I find it so adorable that Pip and Pepper have remained good friends. Pepper really does look out for little Pip. It is quite cute. Pip is a cross from my all white Olive Egger hen (Snow White) and our black silkie, Sir Galahad. She is special because we had to rehome Sir Galahad and I got news that he has disappeared from his new home. It would be nice to be able to keep Pip around. Pepper is a cross from one of my Easter Eggers and my Barred Rock cross roosters (either Kristoff or Percival). I just LOVE those fuzzy cheeks! Time will tell on all the littles. At this point I am pretty positive I have at least 3 roosters and I'm sure more will turn up. I still have really high hopes for both of my Lavender Orpingtons to be pullets. I'll leave you with another cute picture of Pip. Homeschooling has its challenges but I feel the benefits far outweigh the negatives. When given the opportunity to review the book God Schooling: How God Intended Children to Learn by Julie Polanco I was definitely intrigued. I am always open to ideas and opinions on different methods of homeschooling and had dabbled in a little of the "unschooling" method mixed with Charlotte Mason myself. I received a softcover version of this book to review. I think that pretty much sums it up. We have such preconceived notions of what school should be and so many of us feel like we must match what is going on in our public schools. If that model is so great why are there still so many kids that either drop out of school or end up feeling like complete failures? I must admit that as a public schooler myself when I started my homeschool journey with my kids I definitely tried to mimic that model. That is until I learned that my struggling learner son just didn't learn that way. It has been a long journey for me as well, and I am still learning. I myself have not embraced the full method of unschooling and after reading this book I am not sure I can completely school that way, but then again, that is why we homeschool right? We each have our own personal ways of doing things that work for our kids and get them to the ultimate goal of education and hopefully, a love for learning that will continue for them throughout their lifetime. Don't get me wrong, I love the idea of unschooling, just not sure I could pull it off totally. I love all the examples that Julie gives throughout the book and her research is absolutely wonderful. There are so many wonderful references that she gives throughout the book. She sites studies and facts from doctors to back up her methodology. Her two youngest children have Aspbergers and her oldest son Hawk reminds me of my son a lot in their learning challenges. In chapter 1 she goes into detail about how God created us with natural abilities and yearnings to learn. If we, as parents, would open our spirits to what God would have us do with our kids things would go much smoother. She gives examples of the successes when she listened to His still small voice about what paths she should take with her children. When we introduce formal learning too early it is a proven fact that it can cause more learning challenges in the future. Each child is different and individual. That is one reason a lot of us homeschool is so that our children can be taught in the best way that they learn. I also found chapter 2 about what motivates children to be very interesting. She explains why rewards and punishments are just not effective in motivating our children. Rewards can actually teach our children to be manipulative into getting things they want in the future. Instead, she suggests intrinsic motivation. Motivation that comes from within a child that they get from personal satisfaction from doing something well. She sites Mary Hood's book The Relaxed Home School and the three ways to tap into a child's intrinsic motivation. In Part 2 of the book, she breaks down the different categories of learners. Basically, the idea is that most kids are just not ready for formal learning until age 8. It has to do with their brain development and what they are capable of. The next level is age 8 to age 12 where another break is found. After age 13 most children are able to grasp abstract learning better and can move forward into more difficult subjects. I cannot stress how well Julie lays things out. She really has done her research and gives you all the tools you need to do your own. She has scientific facts to back up her methodology and gives you the resources you need to follow up on it. The later parts of the book give yet more ideas of how you can implement the unschooling method into your household and what it looks like when preparing for high school and college. She talks about high school requirements and some ideas for college prep and affordability. Chapter 9 even discusses record keeping and how you would do that for unschooling. She gives several examples to choose from depending on how you prefer to do it. I really liked this book and wish I had had access to it many years ago. It is a true breath of fresh air and if you find yourself burning out or struggling through you homeschool days I highly suggest you give it a read. God Schooling: How God Intended Children to Learn is a definite double thumbs up for me! She currently has a half price e-book sale going on right now through August 22, 2018 and you can get the Kindle version for only $4.99 right now! You can connect with Julie Polanco on FACEBOOK and PINTEREST. Please be sure to check out the other review on this book by selecting the graphic below. If I had known then what I know now, would I have still started raising chickens? Probably. I've always kinda been a farm girl at heart. Never grew up on a farm. Never owned anything more than a dog, cat, mice, and fish. But visits to my aunt's farm when I was young sparked a deep love of farm life for me. I always loved horses. I rode them, showed them, but never owned one. My degree has a specialty in equine science. My heart is on the farm. Enter the day we were able to purchase some land. A small 5-acre tract. Oh, the dreams I had. Here we are 11 years later and still just chickens and a nice sized garden. But, again, the dream continues. I so would love to have goats and probably rabbits in addition to our chickens. I keep reminding myself it was 7 years before I was able to start with the chickens, so in time, maybe. They say chickens are the gateway drug to farming and I can believe it. They are so addicting. I never knew how attached you could get to the feathered beasts. We definitely have our favorites and there are a few of our originals that will always be with our flock until they pass of old age. But for the most part, I still want to raise them for eggs and meat. If I had known how addicting it would be to raise them I still think I would be raising them. There is a funny thing in the chicken world called "chicken math." It's when you can't stop adding to your flock. We all get the bug. It's kinda funny, but not when you realize you need to diminish your flock a little when it has gotten a little bigger than you planned! It's just so fun to raise those cute babies and seeing what cute mixes you can come up with. I learn about a new breed and then wish I had one. Hmmm. But I have learned a lot and have much more to learn. They are fun and funny to be around and they really do make great pets. I will explain more in another post. The enjoyment and peace I get from being around them more than make it worth raising them. And you get eggs and meat to boot! Do you raise chickens? Ever thought about it if you don't? Some of the girls in the 4H pen were enjoying the cooler weather the other day (it got really not again though!). The white one is my olive egger, Snow White. The 3 Silver-Laced Wyandottes are a funny trio. They really do tend to hang together (birds of a feather. . . flock together). 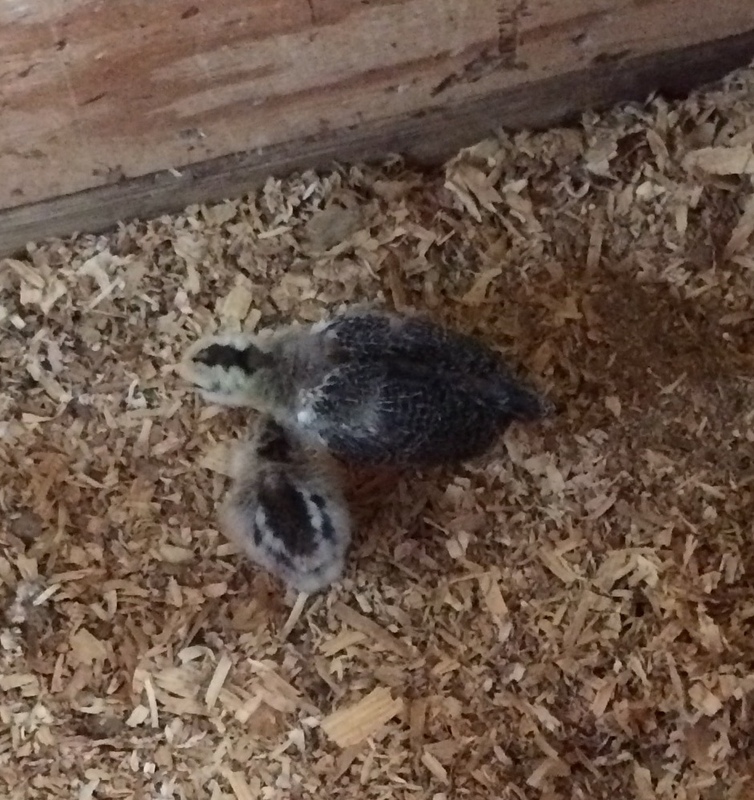 The 2 Marans mix babies in this pen are growing. Still hoping they are both pullets. I'm actually thinking now that they very well may be. All the other babies are growing like crazy too. I didn't name the Wyandottes, but they sure are pretty. 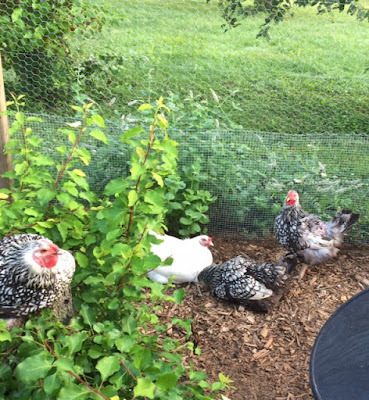 What's new in your chicken yard or homestead? 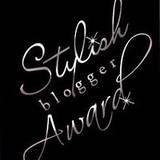 Feel free to share with pictures too!